Srinagar: Terming the communal and fascist agendas of the new Indian government as deadly, Chairman All Parties Hurriyat Conference Syed Ali Geelani cautioned that if this nuisance is not collectively countered, besides Kashmiries, the existence and the identity of all the minorities of India will be in acute danger and their future will be very bleak. Pro-freedom Kashmiri leader said that the communal forces of India want to saffronize this entire region and want to implement their fanatic Hindutva policies here. And for this purpose they are using their state power and are breaching all the moral and cultural boundaries. In a Sunday’s press release, Hurriyat Chairman said that India has forcibly occupied the land of Jammu & Kashmir and they are using the cruel tactics and military power to suppress any voice which is being raised against this illegal occupation but the very presence of those Muslims and the other minorities who chose India and stayed there at the time of partition in 1947 is also intolerable for the fascist government of India and they have started a war against their existence. 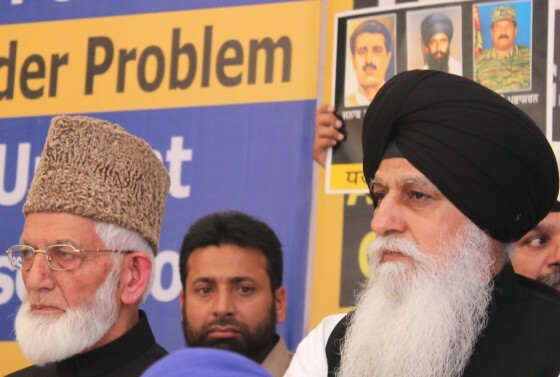 Geelani further said in his statement that besides in Kashmir, a public awareness campaign should be run in the whole of India to counter the dangerous and wicked agendas of the RSS and its allied parties so that the minorities can raise up to protect their existence, their identity and their religion. For this purpose Hurriyat Conference has decided at first stage to organize a seminar in Srinagar in this regard on 14 June, Sunday in which people from different walks of life will express their views over the topic “How to Resist the Indian State Fascism”. 1984 Anti-Sikh massacre case in which Congress leader Sajjan Kumar is accused from the Karkardooma Court to Patiala House Court. 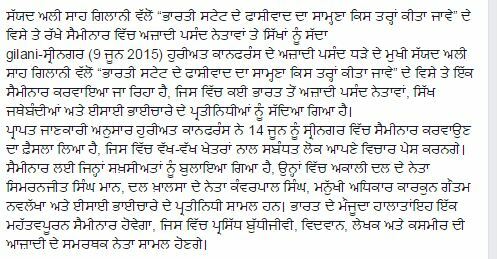 Previous post Dal Khalsa raises serious objections to ‘Inviting Modi for Anandpur Sahib celebrations unreasonable’, on June 19 of Khalsa’s birthplace.